Will and I have lived outside of our home country for three years. When we began this nomadic lifestyle, I envisioned a revolving door of friends and family eager to see us and the beautifully exotic destinations we were calling home for the moment. Things didn’t quite work out that way. My lovely daughter made the trip to Taiwan for our wedding in 2011, and she and her new stepbrother journeyed to Panama to spend Christmas with us that same year. We also had three of Will’s Antarctica friends visit us in Taiwan on their way to other places. Several other people expressed interest in visiting us, some with more sincerity than others, but it never worked out. I know that travel can be expensive, and people have a multitude of reasons NOT to make an international trip, but I was more than a little saddened that I couldn’t share the amazing things we were seeing and doing with more people that I cared about. Then mom came to visit. 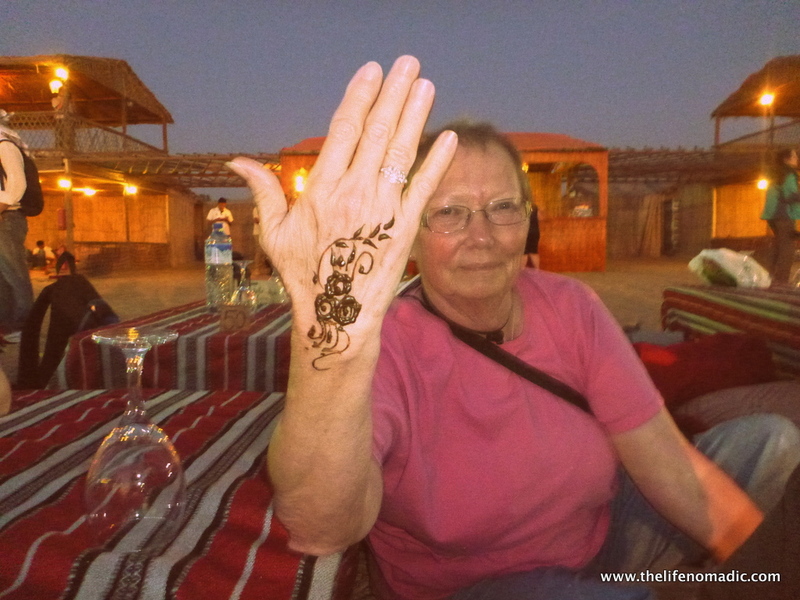 She made the long trip from Salt Lake City, Utah to Abu Dhabi, United Arab Emirates and I was thrilled to death. Of all the people that I wanted to share my new life with, my mom was on the top of the list. Will and I planned a week that I hoped would give her a wonderful memory of the trip. 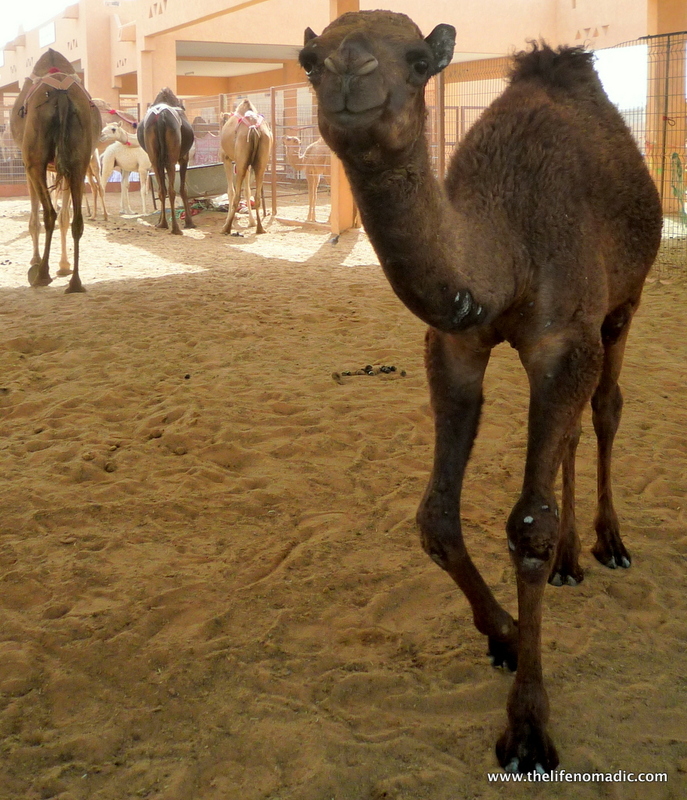 We started bright and early on her first day with a trip to the camel market in Al Ain. About an hour southeast of Abu Dhabi, it’s a quick trip and a great way to get a glimpse into Bedouin life. We all really enjoyed seeing the animals, particularly the cute baby camels. Cute camel at the market. Of course, no trip to Abu Dhabi would be complete without a shopping spree. We spent an afternoon at the Abu Dhabi Mall, purchasing dresses, hats and accessories for the upcoming Dubai World Cup. It had been years since my mom and I had gone shopping together and it was so nice to help her pick a dress. 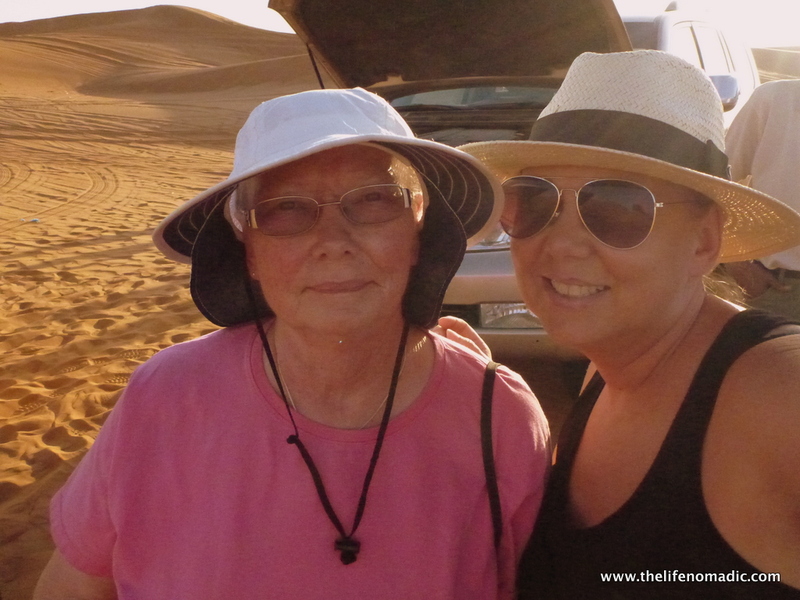 We decided to go on an overnight desert camping trip, which included dune bashing in a 4×4. I wasn’t sure how my mother would take that, but her shrieks of delight from the back seat of the truck assured me she was enjoying herself. The sunset over the desert was exquisite, and while the accommodations were definitely rustic, we all enjoyed ourselves. Dune bashing in the desert! 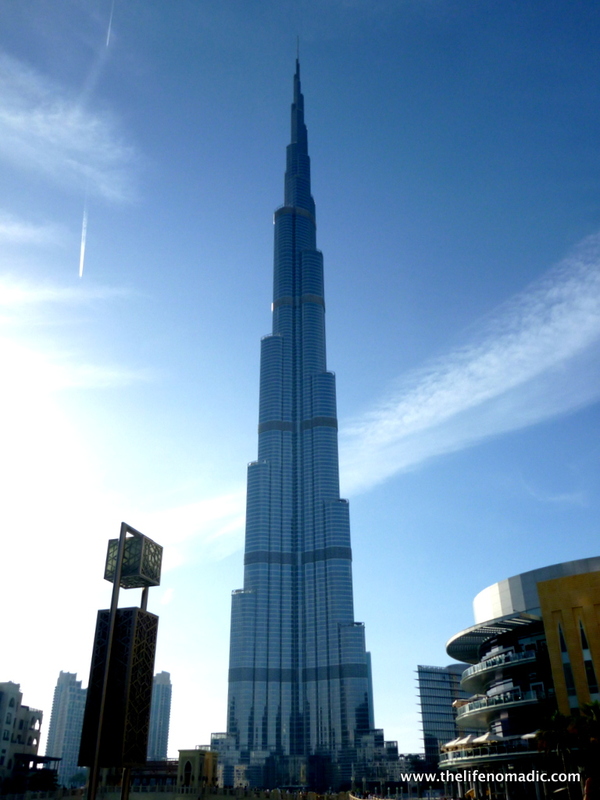 We went back to Dubai in the morning to prepare for our visit to the Burj Khalifa, the tallest building in the world. 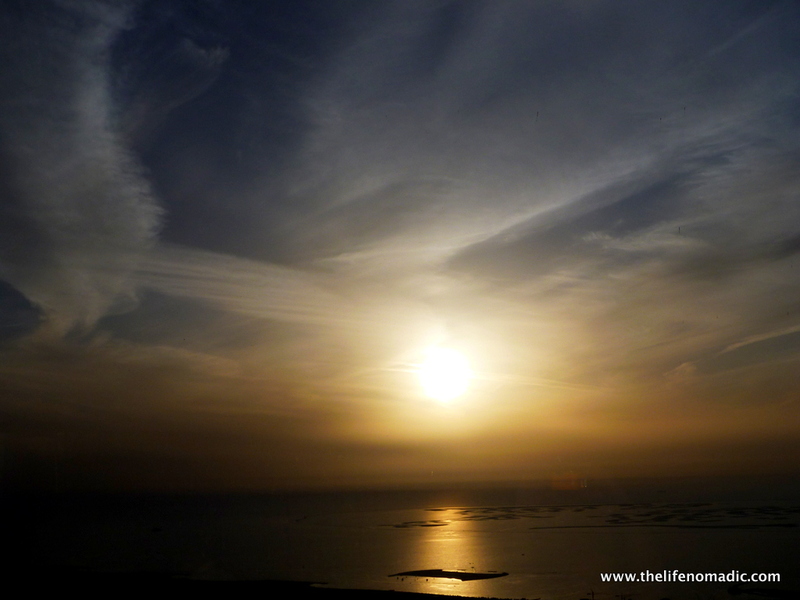 We had purchased tickets for near sunset time, so, when we finally arrived at the top, the views were exquisite. 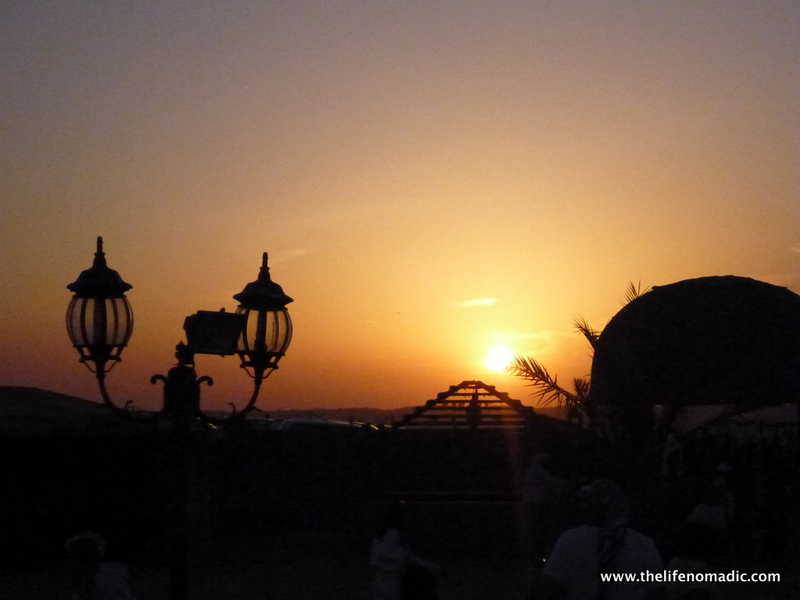 The sun gently sinking into the Arabian Gulf was a sight we’ll not soon forget. The following day was race day, and we spent the afternoon getting dressed up for the Dubai World Cup. We arrived at Meydan Racecourse into one of the most glamorous settings I’ve ever seen, which called for a bottle of champagne, of course. My mother got to meet some of our friends and we cheered the US horse, Animal Kingdom, to victory in the world’s richest horse race. What a fantastic night. 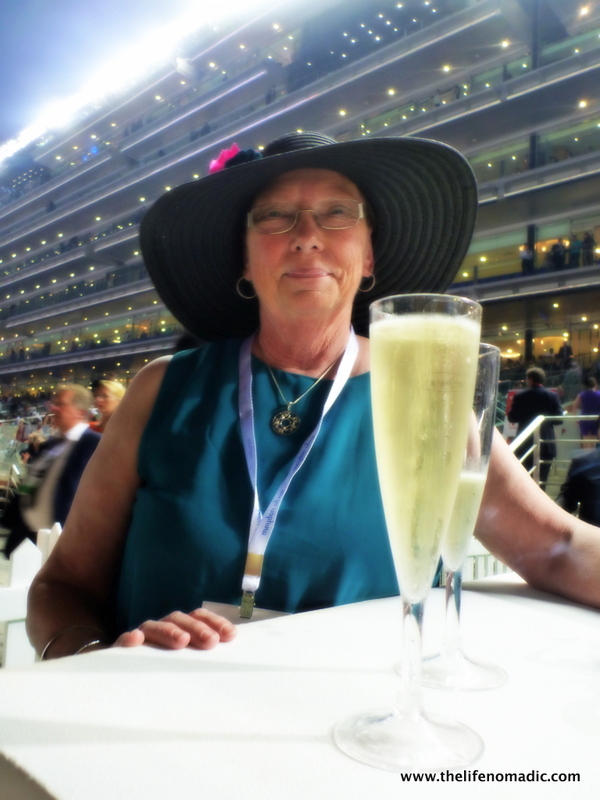 Bubbly at the Dubai World Cup! 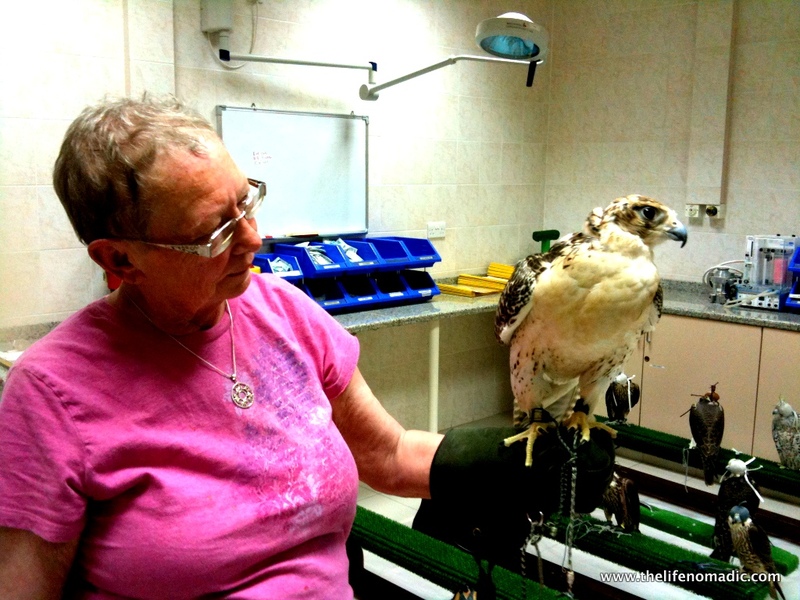 Our last day was spent at the Abu Dhabi Falcon Hospital, which cares for both captive and wild falcons. 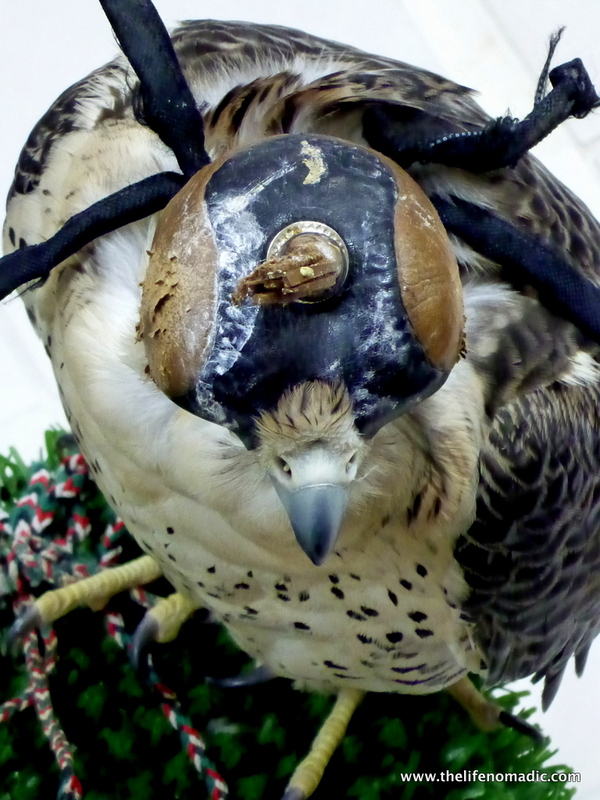 The sport of falconry is big in the UAE, and this specialized vet’s office is considered to be the best in the world. We observed a falcon getting a manicure under sedation, and got to hold the beautiful birds as well. I had to say goodbye to my mom later that night, which was as bittersweet a moment as I’ve ever had. I’m so glad she came to visit, and I can’t wait until she visits again, wherever that may be. Whereever you may be….I will come. What a fantastic week and fantastic people to spend it with. Love you. Wow, so glad Judy got to make the trip! Sure it is one the top 10 things she has done!! Thanks for sharing your stories Cate.